Crosman claims that over 12 million of these little air rifles have been sold during an continuous production run starting in 1964 - that’s well over a quarter a million a year for 45 years - so they must be doing something right with their Crosman 160! To find out, I did what most people do. I went to Wal-Mart and walked out with one under my arm for the princely sum of $29 plus tax. 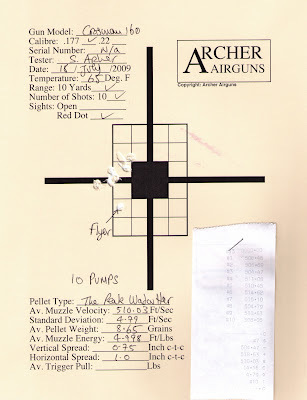 But then I decided to do what most people don’t : I gave the Crosman 760 an Archer Airguns “Gold Service” test to find out what performance it produces. I also tested it with four different types of pellets to see how pellet sensitive this 760 is. Crosman claims a muzzle velocity of up to 600 fps with pellets for the 760. I’m here to tell you that my Crosman 760 achieves nothing close to that with lead pellets - it’s more like 500 fps. But using Crosman Silver Eagle lead-free wadcutters, my 760 did manage to average nearly 630 fps. The gun is overwhelmingly “plastic” to the touch - as most of the parts are made of this material. Personally I don’t like this, but it does make the 760 very light and easy to hold. It’s undoubtedly a big contributor to that sub-$30 price point, too. Pumping was surprisingly hard and made a loud sound each time the forearm completes its stroke and hits the air tube. This actually seems louder than the sound of the 760 firing! 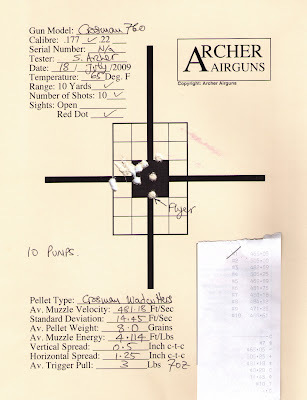 I used 10 pumps for each shot, the maximum recommended by the manufacturer, to achieve the highest muzzle velocity. I thought the trigger was fine. Mine pulled fairly evenly at about 3.5 pounds. And I had no jams in 50 shots (that’s 10 “warm up” rounds plus four test targets of 10 shots each). Not bad! The factory iron sights are also surprisingly good, although I used a red dot scope for the testing. The 760 comes in a nice, brightly-printed box and the instructions are in Spanish and English. I can’t read Spanish, but the English instructions didn’t really seen ideal to me, I still needed a little experimentation to learn how to load the pellets into the clip and the clip into the 760, for example. So how did my 760 shoot? Well, the test targets are below. 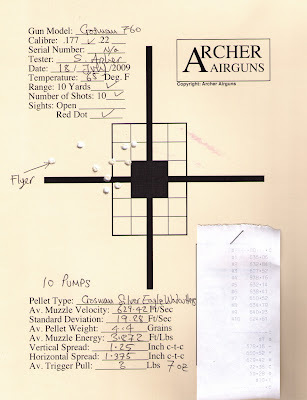 I simply followed the standard Archer Airguns “Gold Service” test procedure four times with different pellets. Each test was fired with 10 pellets. And each time I called a “flyer” with one pellet that was way out of the main group. You’ll see this below. 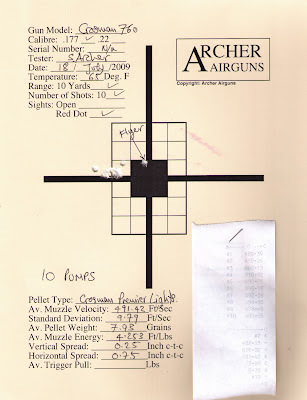 All the tests were shot using my trusty Leapers red/green dot sight. First off, the standard Crosman wadcutters. Available everywhere, these shot at an average muzzle velocity of just over 480 fps, giving a muzzle energy of a little over 4 ft/lbs. Don’t hunt any bird or animal with this gun, there’s not enough power for a humane kill in my opinion. Accuracy was OK-ish. Not bad for a sub-$30 gun with an un-rifled barrel. Next, I tested Crosman Silver Eagle wadcutter pellets. As in every gun I’ve shot these through, the muzzle velocity was excellent - 25% better than with lead pellets. The bad news? That muzzle velocity comes with even less muzzle energy (because of the light weight of the pellets) and abysmal accuracy. I can’t hit the proverbial barn door with these pellets in any air rifle. Third was the turn of the Chinese “The Peak” pellets that we sell. These produced better accuracy and muzzle energy than the Crosman lead wadcutters, probably because they use a softer lead and have a wider “skirt”. These probably sealed better in the barrel and allowed less air to leak past the pellet than the Crosman wadcutters. They gave the highest muzzle energy at nearly 5 ft/lbs, together with fairly reasonable accuracy. Finally I tested Crosman Premier Light pellets. These domed pellets are relatively expensive, but wow, what great accuracy! Suddenly the 760 was producing excellent accuracy, vastly better than I expected for this little air rifle. Just look at this test target! So, the little 760 finally found a pellet it liked, and how! Interesting review. The CPLs work well with that $30 gun, maybe that's why Crossman sold 12m+ of them. Great review. Thanks. I came across it searching for info on this gun for my son. I'm thinking about his 1st bb gun for Christmas, and was torn btwn this and the Daisy red rider.. Is there anything else comparable under $50? Thanks for the great site! Kirk, I've not tested a Red Ryder so I can't make a valid comparison. But for $30 from Wal-Mart (and they sell the Premier pellets that shoot so well in it, too) I can't see how you can go wrong with the 760. The 760 will also shoot BBs (I tested it with pellets), but accuracy will not be in the same league. "Overall, I feel that you can’t complain about the Crosman 760 for $29.00. But somewhere around $70 buys a far, far, far better air rifle, such as the QB78 or QB36-1. These guns are all metal and wood and will last a lifetime, they’re more accurate and significantly more powerful, yet still easy to shoot - and they don’t need all that noisy pumping..."
True, the 760 isn't like it used to be, due to the mostly plastic construction. I agree the metal/wood construction of the airguns you offer are more desirable for some, as innovative use of polymers (plastic just sounds "cheap" doesn't it?) is very "in". I'm trying to build a couple of 1377 "carbines" so I've literally come back to the "pumping" airguns of earlier years (yes a 760 was my first pumper - still got it too). Three pumps are enough for 5-10yd shooting. Still, I've got online friends who've gotten me looking at those CO2 guns too. I think the 760 is a good gun for the money, im 15 and ice shot thousands of bbs and hundreds of pellets through it and it still works great! Pellets are way more accurate, but are expensive. I recomend a 10x scope for it, greatly increses accuracy. Not good for hunting tho, good for small pests like mouses or rats but if your looking for a good bb/pellet gun for hunting i highly reccomend the Remington Airmaster 77 it more powerfull (750 fps) and more acurate and it dosent have that light plasticy feel, its a great gun for the money. Thanks!! 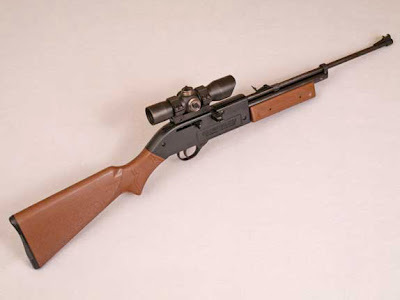 They have offered the 760 with a rifled barrel and wooden stock, which you should try. I love mine. I GOT MY 760 TO STING A DOG EATING MY RIPE TOMATOES. IT'S LOW POWER BUT MAKES AN IMPRESSION. The important thing to know is that the 760 is an air Musket not an air RIFLE. The barrel is smooth bore on these. They used to be rifled, but no more. That explains the poor accuracy. Why would anyone design a Musket with a scope mount rail? Gives the illusion of being a rifle and of having accuracy potential. As far as I know they are still rifling the barrels in the Daisy 880's; of course they are made in China. The QB's are great guns, I have a couple of them and like them. Thanks for giving an honest test of the advertised velocity numbers on the 760. You're correct, of course. The 760 I tested has a barrel that is not rifled. No doubt that contributes to achieving the low price for which these guns are sold. Thanks a lot for the great review it was very helpful and it is making me consider spending a little bit more money for a better quality gun. Also allows me to use less power so I can shoot indoors. 1 or 2 pumps is all I need or want with my homemade BB trap. If I take it outdoors and shoot longer distance, then I can adjust the amount of pumps accordingly. If I end up needing it for its intended purpose (chasing foxes out of my yard), I don't want to even wound if I don't have to, let alone kill. I don't even want to have to aim at them if I can help it. I'd rather start with a nearby, inanimate, noisy target. With less power, hopefully the ricochet won't hurt or damage anything else. I came across your review while looking for information on the newest variation of the 760 available this summer. It is too bad that you started with the worst 760 ever made. The 760 was first made in 1966. They were made of metal and wood with rifling, they cost $27.95.There have 9 variations(about to be 10) the receiver remained metal until the 7th. with the 7th variant a plastic receiver and the sights lost their windage adjustment. The 9th lost its rifling and gained that stupid pellet clip but the price remained the same. My first air rifle was a 2nd variation with a 4x15 scope,it could pop tacks through a cardboard box at 30 ft. all day long. If you want to try a 760 at its best you should find 5th or 6th variation in good shape. To compare the 760 to the two other rifles seems a little apples to oranges considering the different power plants and that they are well over twice the price. Not having to teach the artillery hold to a new shooter is a good thing and that clicking sound when you pump it up is the sound of not having to buy co2. If you find the 760 hard to pump up what ever you do don't get a Benjamin pump up, you might pull a muscle. Though I do think the latest 760 is a poor example when compared to its predecessors it is cheap to buy and fun to shoot. Mark, thanks for your input. I tested this model as it is the currently manufactured version and so the one most people would be able to purchase. Personally, I also would prefer a wood and metal model, but I'd guess that it would cost much more than the $30-ish the current model sells at! Thanks for that very good review. I make my own targets and pellet traps. Basically I trace a penny on off white paper in red or blue ink. After shooting the gun in my basement at close range for 2 weeks I finally took it out to the backyard for more distance shooting. Well, I keep a target journal and with BBs I average 8/10 in the penny circle at 30 feet. 8.5/10 for premium pointed pellets. Less accuracy with Premier Hollow Points (just under 8.5/10). Well, Cwj, that sounds like pretty good shooting to me! I'm particularly interested to see that you obtain best accuracy with BBs - I didn't shoot those in my test. I just thought I would mention that since my last comment I've added the cheap Crosman 4X "Targetfinder" scope to my 760. I've also ceased using BBs and shoot only pellets these days. I'd be very curious to see how a scoped 760 performs against any other smooth bore "rifle". Maybe I just got lucky and my particular 760 is an exception, but I seriously can't miss it seems. My friend also has a 760, but it has poor accuracy (tried it out myself). I now hit a dime target (1.8cm circle) at 50 feet 18 out of 20 shots on average (90%). 70 feet or so seems to be the maximum "fun" (non-bullseye) range for this gun. Anyway I just thought I'd mention this. I own a Crosman 760 and appreciate the review from someone like yourselve Mr Archer. I like the accuracy of the BB's as well as the pellets. It's just fun and the gun seems right to me when mounting. I recently restored a first run 760 with brass bolt and trigger! Thank you for excellent service to your customers sir. I've had 2 760's, one when I was 8 and after losing that one I purchased another 15 years ago(I'm 38 now). I'm fortunate to have a plastic stocked/rifled barreled model, non clip fed for pellets. Seems to only shoot in the 400's now however just this weekend I was able to hit at 25yds accurately using a 20year old 3-7 x 20 Tasco scope! Time of flight was long but a hit's a hit :). Also, I just invested in a Daisy 901, rifled steel and great pumping action, for $45. My next airgun however will be a qb78 as my friend owns one and recently upgraded the bolt, seals and bolt handle, wow, what a shooter! Thanks for posting this. I swear, all the way back to around 1974, I think my parents paid close to $29 for a Crosman 760 Pumpmaster for me! So the price has stayed the same for all those years. That's quite a bargain in 2013. I've had mine 7 years and she's a keeper. I can hit a soda can with pretty good groups at 30 feet with the fiber optic sights on mine. I've probably shot my 760 more than my 10/22 with the shortage of .22 shells all over the country. With that being said, I purchased a crosman 357-6 pistol and a Daisy 880 rifle as well and made those my new plinking guns until the ammo shortage ends (somewhere over the rainbow). I bought my 760 in 1976. It is still shooting well. I used it years ago to start training my two children, now grown, about gun safety. By taking turns, they practiced to become fairly accurate, each receiving some special recognition locally. Now after about 37 years, the little spring on the BB feed reservoir broke and i cannot find parts to replace it. I own a Crossman 760D. Manufactured 03 of 1999 per Crossman. (first 3 digits of serial number = month and year) I've tried a few different pellets and mine really likes RWS Super H Point. At 30 ft it will shoot dime sized holes if I do my part. I seldom pump it 10 times. Usually only 7 and sometimes 8 if it is a longer shot. I have shot countless house sparrows, starlings and pigeons, and over a dozen rabbits with my 760. A well placed head shot and the rabbits just collapse. To pump the 760 quietly, simply hold the gun, barrel pointing safely up, gripping the receiver in your right hand, with the top of your index finger near the top of the receiver block. Then grip the pump with your left hand so that the heel of your left hand overlaps your index finger. When you pump, the soft heel of your left hand contacts your finger. With a little practice this becomes very fast and super quiet. Great little air rifles for the money. Keep in mind that in 1966, $30 is equivalent to over $200 today. So that would explain why the older guns are made better. Even in the 70s, $30 is over $100. So being made for $30 today, well... can't wait to see what they look like another 20 years from now haha. I purchased a 760 in the early 80s. I remember picking it up at Kmart and costing $30-35. It has a metal receiver and plastic stock. Also has the rifled barrel. I put a Bushnell 3-9x scope on it back then, which is still on it. I am sure the scope cost more than the gun. Used it alot that first year and then slowly got away from it. Only using it on occassion, sometimes not for years in between. I recently got back into airguns after finding the old 760 tucked away in a closet. It has been at least 5 yrs since I last shot it. Wow did it bring back memories. Found the a tin of pellets I purchased way back in the 80s as well. I did pick up a new pack of pellets (from that same Kmart no less lol ) to have on hand once the old ones are used up. It seems the seals are still working as they did back in the 80s. I did the recommended maintenance on it and have been shooting it the past few months. It is fairly accurate! I found this page after searching if there were any mods that could be done to improve power or the trigger. Doesn't seem to be the case so I will enjoy the gun as it was made. The only thing I may do is add a TKO muzzle brake on it to reduce the shot noise. After contacting them I am told it will fit the barrel perfectly. I am thinking of reviewing my old 760 for accuracy and posting it online. I can't seem to find anyone who has done that for the rifled 760, only for the new ones. Another thing you can easily do if the pump noise bothers you, is to put a strip or two of electric tape where the pump handle contacts the pump tube.